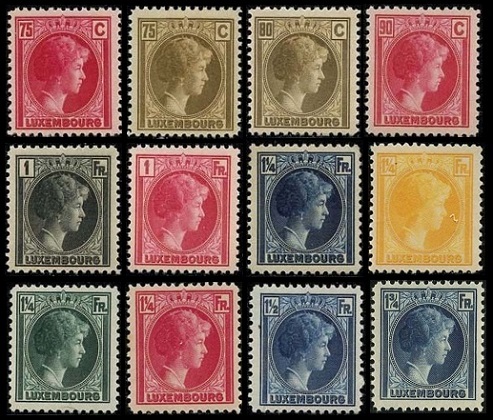 The definitive Luxembourg stamps of 1923 to 1939 feature more high-denomination pictorial stamps, two series of revalued stamps, and a new series of portrait definitive stamps containing new denominations and color changes. 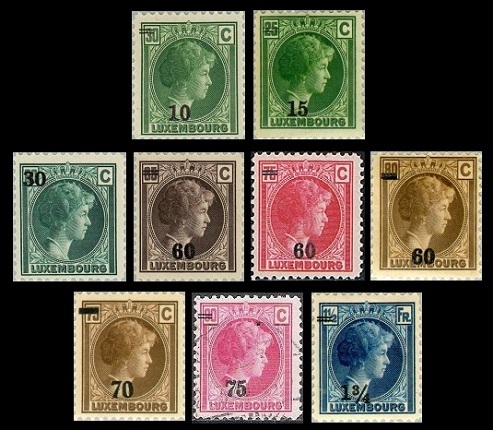 The five definitive Luxembourg stamps of 1921-1924, shown above, were overprinted and re-valued between 1925 and 1928. 05 C. on 10 C. (1925 - Sc. #154) - Yellow Green. 15 C. on 20 C. (1928 - Sc. #155) - Yellow Green. 35 C. on 40 C. (1927 - Sc. #156) - Brown Orange. 60 C. on 75 C. (1927 - Sc. #157) - Deep Blue. 60 C. on 80 C. (1928 - Sc. #158) - Black. 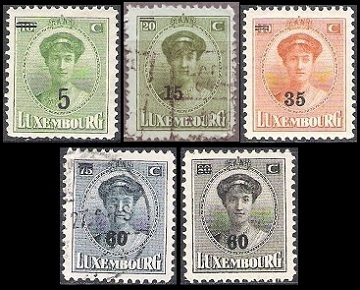 The twenty-seven higher-denomination portrait definitive Luxembourg stamps shown above were issued between 1926 and 1935. These new stamps were engraved on unwatermarked paper, and they are perforated 12. The common design features the right-facing portrait of Grand Duchess Charlotte of Luxembourg. 05 C. (1926 - Sc. #159) - Dark Violet. 10 C. (1926 - Sc. #160) - Olive Green. 15 C. (1930 - Sc. #161) - Black. 20 C. (1926 - Sc. #162) - Orange. 25 C. (1926 - Sc. #163) - Yellow Green. 25 C. (1927 - Sc. #164) - Violet Brown. 30 C. (1927 - Sc. #165) - Yellow Green. 30 C. (1930 - Sc. #166) - Gray Violet. 35 C. (1928 - Sc. #167) - Gray Violet. 35 C. (1930 - Sc. #168) - Yellow Green. 40 C. (1926 - Sc. #169) - Olive Gray. 50 C. (1926 - Sc. #170) - Red Brown. 60 C. (1928 - Sc. #171) - Blue Green. 65 C. (1926 - Sc. #172) - Black Brown. 70 C. (1935 - Sc. #173) - Blue Violet. 75 C. (1926 - Sc. #174) - Rose. 75 C. (1927 - Sc. #175) - Bister Brown. 80 C. (1926 - Sc. #176) - Bister Brown. 90 C. (1927 - Sc. #177) - Rose. 01 F. (1926 - Sc. #178) - Black. 01 F. (1930 - Sc. #179) - Rose. 01 1/4 F. (1926 - Sc. #180) - Dark Blue. 01 1/4 F. (1930 - Sc. #181) - Yellow. 01 1/4 F. (1931 - Sc. #182) - Blue Green. 01 1/4 F. (1934 - Sc. #183) - Rose Carmine. 01 1/2 F. (1927 - Sc. #184) - Deep Blue. 01 3/4 F. (1930 - Sc. #185) - Dark Blue. 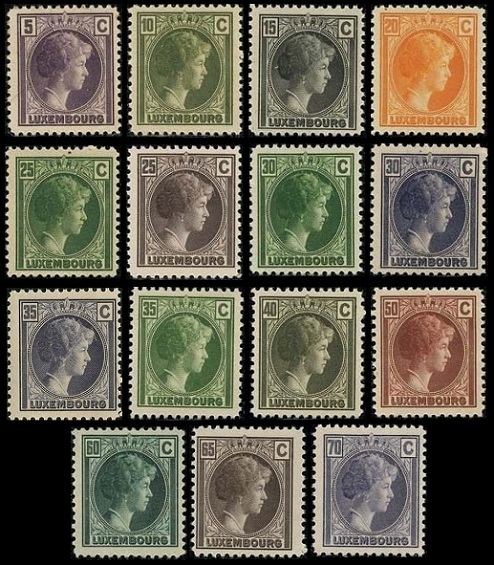 The nine definitive Luxembourg stamps of 1925-1928, shown above, were overprinted and re-valued between 1928 and 1939. 10 C. on 30 C. (1929 - Sc. #186) - Yellow Green. 15 C. on 25 C. (1928 - Sc. #187) - Yellow Green. 30 C. on 60 C. (1939 - Sc. #187A) - Blue Green. 60 C. on 65 C. (1928 - Sc. #188) - Black Brown. 60 C. on 75 C. (1928 - Sc. #189) - Rose. 60 C. on 80 C. (1928 - Sc. #190) - Bister Brown. 70 C. on 75 C. (1935 - Sc. #191) - Bister Brown. 75 C. on 90 C. (1929 - Sc. #192) - Rose. 01 3/4 F. on 01 1/2 F. (1929 - Sc. #193) - Deep Blue. 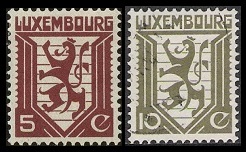 The two lower-denomination definitive Luxembourg stamps shown above were issued on December 20, 1930. These new stamps were typographed on unwatermarked paper, and they are perforated 12 1/2. The common design features a stylized Coat-of-Arms. 05 C. (1930 - Sc. #195) - Claret. 10 C. (1930 - Sc. #196) - Olive Green. The 10 F. denomination horizontal-format pictorial definitive Luxembourg stamp shown above (Sc. #152) was issued first in 1923 (perforated 11 1/2) then again in 1934 (perforated 12 1/2). The design features a View of Luxembourg City from the park in front of Fort Thüngen. 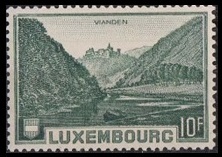 The 3 F. denomination vertical-format pictorial definitive Luxembourg stamp shown above (Sc. #153) was first issued in 1923 (perforated 11 1/2) then again in 1934 (perforated 12 1/2). The design features the Wolfsschlucht (Wolf's Glen) near Echternach. The 2 F. denomination horizontal-format pictorial definitive Luxembourg stamp shown above (Sc. #194) was issued first in 1928 (perforated 11 1/2) then again in 1934 (perforated 12 1/2). The design features a View of Clervaux, showing Clervaux Castle (12th Century) and the Abbey of St. Maurice (founded in 1890). 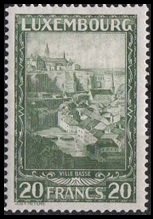 The 20 F. denomination vertical-format pictorial definitive Luxembourg stamp shown above (Sc. #197) was issued on June 20, 1931. The design features a view of the lower part of Luxembourg City. 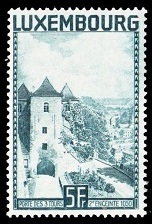 The 5 F. denomination vertical-format pictorial definitive Luxembourg stamp shown above (Sc. #198) was issued on August 30, 1934. The design features the Gate of Three Towers. The Gate of Three Towers or the Triple Gate Tower is the original Gate of the 10th Century Fortress of Luxembourg, which would eventually become Luxembourg City. The 10 F. denomination horizontal-format pictorial definitive Luxembourg stamp shown above (Sc. #199) was issued on November 15, 1935. The design features a View of the Our Valley with Vianden Castle in the distance. Vianden Castle was founded in the late 11th Century on the site of an Ancient Roman fortress. It was the home of the Counts of Vianden until the 15th Century. The castle is now a historical landmark belonging to the Grand Duchy of Luxembourg.